A few days ago on Twitter, John McIntyre wrote, “A reporter has used ‘comprises’ correctly. I feel giddy.” And a couple of weeks ago, Nancy Friedman tweeted, “Just read ‘is comprised of’ in a university’s annual report. I give up.” I’ve heard editors confess that they can never remember how to use comprise correctly and always have to look it up. And recently I spotted a really bizarre use in Wired, complete with a subject-verb agreement problem: “It is in fact a Meson (which comprise of a quark and an anti-quark). “So what’s wrong with this word that makes it so hard to get right? I did a project on “comprised of” for my class last semester on historical changes in American English, and even though I knew it was becoming increasingly common even in edited writing, I was still surprised to see the numbers. For those unfamiliar with the rule, it’s actually pretty simple: the whole comprises the parts, and the parts compose the whole. This makes the two words reciprocal antonyms, meaning that they describe opposite sides of a relationship, like buy/sell or teach/learn. Another way to look at it is that comprise essentially means “to be composed of,” while “compose” means “to be comprised in” (note: in, not of). But increasingly, comprise is being used not as an antonym for compose, but as a synonym. It’s not hard to see why it’s happened. They’re extremely similar in sound, and each is equivalent to the passive form of the other. When “comprises” means the same thing as “is composed of,” it’s almost inevitable that some people are going to conflate the two and produce “is comprised of.” According to the rule, any instance of “comprised of” is an error that should probably be replaced with “composed of.” Regardless of the rule, this usage has risen sharply in recent decades, though it’s still dwarfed by “composed of.” (Though “composed of” appears to be in serious decline. I have no idea why). 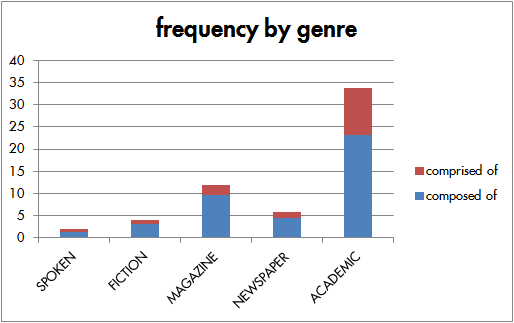 The following chart shows its frequency in COHA and the Google Books Corpus. 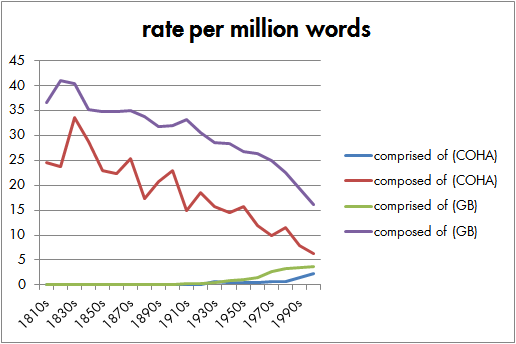 What I find most striking about this graph is the frequency of “comprised of” in academic writing. It is often held that standard English is the variety of English used by the educated elite, especially in writing. In this case, though, academics are leading the charge in the spread of a nonstandard usage. Like it or not, it’s becoming increasingly more common, and the prestige lent to it by its academic feel is certainly a factor. But it’s not just “comprised of” that’s the problem; remember that the whole comprises the parts, which means that comprise should be used with singular subjects and plural objects (or multiple subjects with multiple respective objects, as in The fifty states comprise some 3,143 counties; each individual state comprises many counties). So according to the rule, not only is The United States is comprised of fifty states an error, but so is The fifty states comprise the United States. It can start to get fuzzy, though, when either the subject or the object is a mass or collective noun, as in “youngsters comprise 17% of the continent’s workforce,” to take an example from Mark Davies’ COCA. This kind of error may be harder to catch, because the relationship between parts and whole is a little more abstract. And with all the data above, it’s important to remember that we’re seeing things that have made it into print. As I said above, many editors have to look up the rule every time they encounter a form of “comprise” in print, meaning that they’re more liable to make mistakes. It’s possible that many more editors don’t even know that there is a rule, and so they read past it without a second thought. Personally, I gave up on the rule a few years ago when one day it struck me that I couldn’t recall the last time I’d seen it used correctly in my editing. It’s never truly ambiguous (though if you can find an ambiguous example that doesn’t require willful misreading, please share), and it’s safe to assume that if nearly all of our authors who use comprise do so incorrectly, then most of our readers probably won’t notice, because they think that’s the correct usage. And who’s to say it isn’t correct now? When it’s used so frequently, especially by highly literate and highly educated writers and speakers, I think you have to recognize that the rule has changed. To insist that it’s always an error, no matter how many people use it, is to deny the facts of usage. Good usage has to have some basis in reality; it can’t be grounded only in the ipse dixits of self-styled usage authorities. And of course, it’s worth noting that the “traditional” meaning of comprise is really just one in a long series of loosely related meanings the word has had since it was first borrowed into English from French in the 1400s, including “to seize,” “to perceive or comprehend,” “to bring together,” and “to hold.” Perhaps the new meaning of “compose” (which in reality is over two hundred years old at this point) is just another step in the evolution of the word.